WOW- so much today ... lets see..First of all, my dad is celebrating a milestone birthday!! !We celebrated over the weekend with Brunch at my house.... HAPPY BIRTHDAY POPS!!! 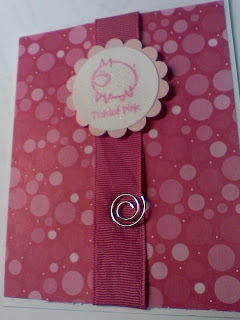 I got this PINK card to show off. ITS ONLY TUESDAY!!!! 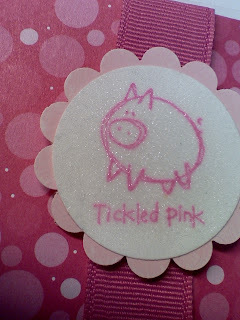 Its a fun stamp set... and I think I have used this most... i embossed the circle with a glitter powder for some sparkle. I actually pulled this out, when I remembered the painter was arriving and I wasn't going to have access to my stamp goodies for one solid week.